county due to new EAB discovery in Duluth. The emergency EAB quarantine limits the movement of firewood and ash material out of the quarantined area of the county. 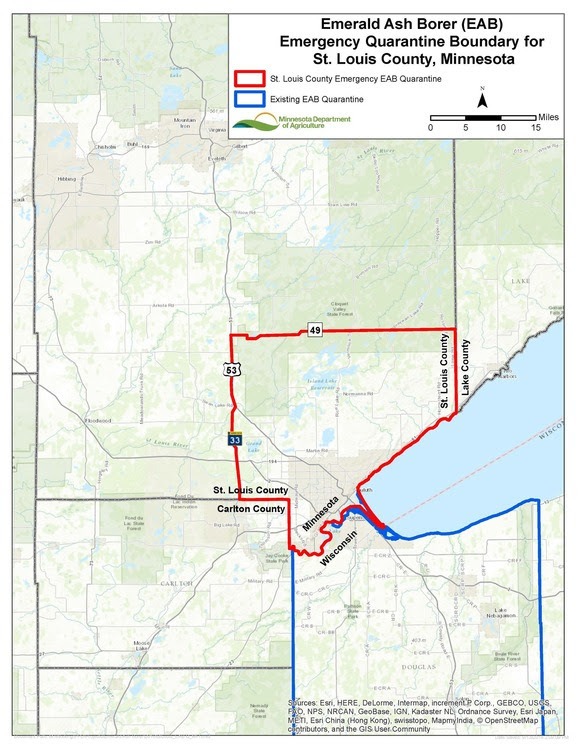 The quarantined area now runs from MN Highway 33/US Highway 53 on the west to the Lake County border on the east. 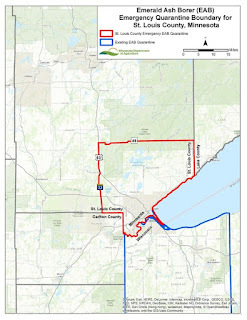 The northern border of the quarantine runs from US Highway 53 along Three Lakes Road (County Highway 49) east to the intersection of Vermilion Trail. It then continues along the northern edge of Gnesen, North Star, and Alden townships. This extends south to the Carlton County/State of Wisconsin border. To see the original MDA news release, go here. For more information on EAB, see Emerald ash borer in Minnesota.